STILL WATERS The creation of side-channel habitat on Lagunitas Creek and Green Valley creeks is designed to give steelhead and coho salmon refuge during heavy winter rains. The bad news is that the drought is back and that's not good for spawning fish. The good news better habitat awaits coho salmon and steelhead in two North Bay creeks. In Sonoma County, the Gold Ridge Resource Conservation District worked with the Thomas Creek Ranch Homeowners Association to restore lower Green Valley and Thomas creeks in Forestville as a winter coho salmon wetland habitat several years ago. Only recently, in the aftermath of the last drought, have those efforts borne fruit. In Marin County, meanwhile, officials are cheering the performance of newly restored floodplains on Lagunitas Creek, one of the most productive salmon creeks in the state. The Forestville project began in 2014 when the conservation district constructed a 220-foot side channel and wetland along Green Valley Creek, and realigned a section of Thomas Creek to create a deep backwater "alcove" for fish. The drought made it difficult to tell if the construction was making a difference in the coho salmon population, due to the sluggish winter flow. Called an "off-channel winter refuge habitat enhancement for salmonids," the project is aimed at giving young salmon refuge from high flows in wintertime that otherwise could sweep them away. Green Valley Creek used to provide habitat, but residential developments along the creek along with a demand for the water by farmers have greatly reduced the coho salmon and that aquatic insects that lived and bred in the calm waters of the channels. "Our whole community is thrilled with the project and glad that we were able to provide the space to make it happen," says association member Alan Siegel. Siegel, an environmentalist since his high school days, came up with the idea to help restore the creek's natural habitat when he took his daughter, Katie, to a salmon fishery about 10 years ago. He convinced his fellow association members to dedicate land along the creek to the conservation district. "It took many, many years to figure out what kind of project [they] wanted to do," he says, "and then once that was nailed down, it took many more years to get all the funding. Grants and funding for the $550,000 projects came from the National Oceanic and Atmospheric Administration's Fisheries Restoration Grant Program, the California Department of Fish and Wildlife, the California Coastal Conservancy and the Sonoma County Water Agency. With salmon thriving in the creeks, Siegel says the district is now looking to collaborate with more landowners on similar projects. "One of the things they really want to show is that they can work together with private landowners in a cooperative way that benefits the fishery and the landowner," he says. 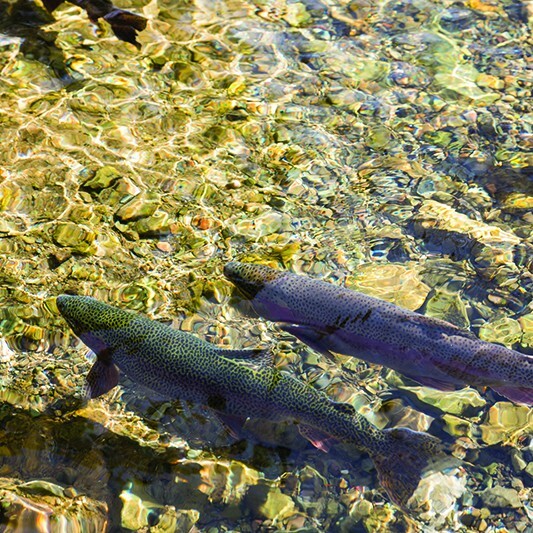 Meanwhile in Marin County, coho salmon and steelhead trout, a federally threatened species, are returning to Lagunitas Creek thanks to a similar floodplain restoration project undertaken by the Marin Municipal Water District (MMWD). Last fall, water district fisheries program manager Gregory Andrew was hoping for a season of average rainfall. Too much rain, he said, could scour away sediment and wash out newly created wooden structures designed to help re-animate legacy floodplains on Lagunitas Creek, one of the state's most abundant when it comes to endangered coho salmon. Too little rain, on the other hand, wouldn't see enough water in the creek to spill over into the newly created floodplains, which are designed to attract spawning salmon and steelhead. With the key drought arbiter, the Sierra snowpack, coming in at a dismal 70 percent below normal this year, the drought is back. But Andrew says the restoration project performed remarkably well this winter as he notes that a big rainstorm that blew through on Jan. 8-9 this year raised the flows in the Lagunitas Creek to levels sufficient to inundate the floodplain channel. The coho apparently took notice. Fish are monitored at every life-stage by surveyors, says Andrew, who cautions that there is a lot of variability from year to year, "and also lots of variability from one life phase to another." For example, he says, this year the adult coho spawning numbers are below average. Yet last year fish surveyors marveled at juvenile smolts headed to the sea for the first time, "in numbers we never saw before," he says. The good news is that the fish stocks are generally headed in the right direction after the low point of 2008-09. "With the smolt numbers," he says, "there is some indication that there is increased winter survival and that may be related to the habitat enhancement work that we've already done." Project monitors have utilized time-lapse video of the creek this winter to monitor the restoration and the weather's impact on the work done so far. During the January storm, he says, water flows on the creek got close to 1,000 cubic feet of water per second (the summertime standard is about 8 lazy cubic feet per second). Planners had hoped that those channels would become engaged by the flow when the water was flowing at between 100 and 300 cubic feet per second. The fact that the channels were "engaged" at the low end of their expectation was an encouraging sign to Andrew. The Phase I part of the project at Platform Ridge Road and the Sir Francis Drake Highway, he says, "behaved beautifully and the flood-plain channel engaged at 100 cubic feet per second." This time of year, the typical flow in the Lagunitas runs up to 2,000 cubic feet per second, Andrew says. The drought-busting winter of 2016-17 saw days where the creek was ripping along at 5,000 CFPS, which could have been perilous to the work undertaken this past summer. "I'm glad that our structures weren't newly constructed last fall," Andrew says, invoking the year the drought broke. The successful rollout of this $1.2 million, two-year project occurs in a year which sounds like a pretty good one for the state's salmon fisheries. Andrew says the year has been "unusual for salmon," given that, for example, a pink salmon showed up in the Lagunitas "and we have not seen them for many years." He says there was a good run of Chinook and chum salmon on the creek, too. "Over the years we've seen chinook come and go and have seen a relatively small number of chum salmon. This year, we had them all in early. Then the coho came in, and they tend to do their thing in January and February." "Their thing," is to spawn. The coho are all gone now, Andrew says, and now it's the steelhead trout's time to breed—"they're the only species that's in there now." The steelhead numbers too are "looking pretty good," Andrew reports. Just that morning he'd gotten a report about a big school of the fish hanging out under a bridge in Pt. Reyes Station, near where the Lagunitas spills out into Tomales Bay, and ready to head upstream into their fancy new floodplain.